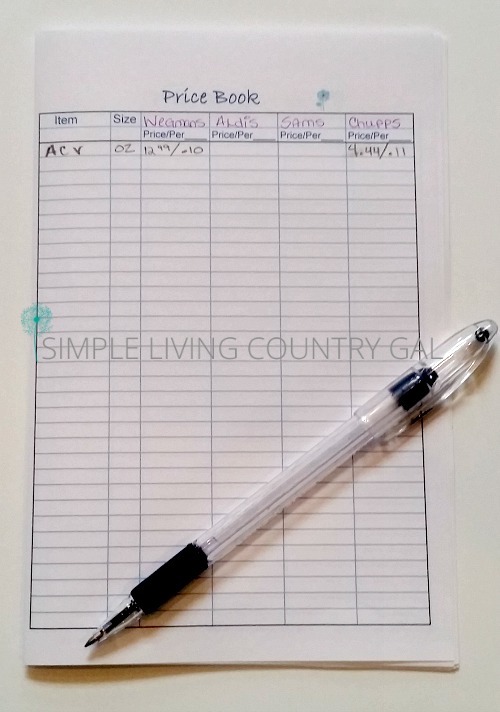 A price book is a small book where you keep track of prices on items you use on a regular basis. I thought this could possibly be the game changer I was looking for and it turned out to be right. This one tip alone saved me over $150 dollars a month! Now, I am not going to sugar coat it. Setting up a price book takes time, lots of time. But trust me, it is worth the time investment. To make it easier I broke it down into steps. Cuz, that’s how I roll. Step #1 Create your own. Find a notebook that is small. You really want to find something that will hold all the prices you need, is easy to organize and small enough to fit in your purse. Remember, you will take this book every time you go to the store, so keep it compact. Step #2 Section it off. You can either do this alphabetically or by aisle. It is all a matter of preference. Small tabs will help segment off different areas making things a bit easier to find. You will need a column for each store, one listing the size of the item and one listing the price per oz. Step #3 Print out my free printable instead! Since I want to make things really easy, and because I know your time is super valuable, I created a printable just for you. You can get access to the price book printable and other great printables by signing up for my uber amazing newsletter at the bottom of this post. When you print out the price book, you can flip the paper and print again. Once finished fold in half and you have a compact price book all ready to go! I left room in the price column so you can list out the price per size. I have found this is by far the easiest way to ensure you are getting the best value. Step #4 Mark out some time. This isn’t something you can rush. So, plan to do one store at a time so you can get the best record. When I first did my price book I spent about 20 minutes in each store. *Note: Most people do this from their receipts but I prefer to do it in store. I want to make sure I am getting the regular price and not a special or sale. Plus I am a visual person, so doing this in person was a good education on the different products out there. Step #5 Visit every single aisle. There really is no way to remember everything you use in your home, so you will need to visit every aisle. 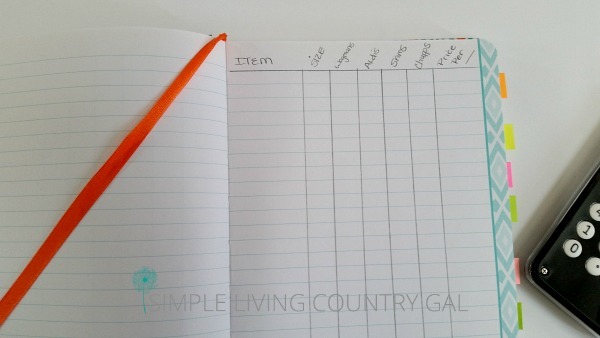 Look at each item and jot down everything you use regularly. I would not recommend items that are treats or seasonal. The book needs to be easy to use, the more you cram into it the harder it is to find things later. This is a silly but important tip. Write everything in pencil. I guarantee you will be changing it. Step #7 Record regular price and unit price. It is important to list the regular price only so you will truly know when a good deal arises. I also include the price per ounce. This way when I am comparing I know the absolute best price no matter what the size is. Bigger is NOT always cheaper. I have noticed boxes getting smaller and prices getting higher. Don’t let manufacturers take advantage of you, record the price per ounce to always ensure you get the best possible deal. Step #8 Never forget your book! Once the book is done you will have a gold mine at your fingertips. Keep that little book with you at all times. If you stop in a store for a quick shop and you see a deal on ground meat, just refer to your price book to see if it is worth a purchase. If it is, stock up friend! From here on in you will never look at grocery shopping the same again. Instead of blindly shopping your way through a store, you will now always be checking for the lowest price on everything you buy. You will be amazed at how much this magic book is going to save you! 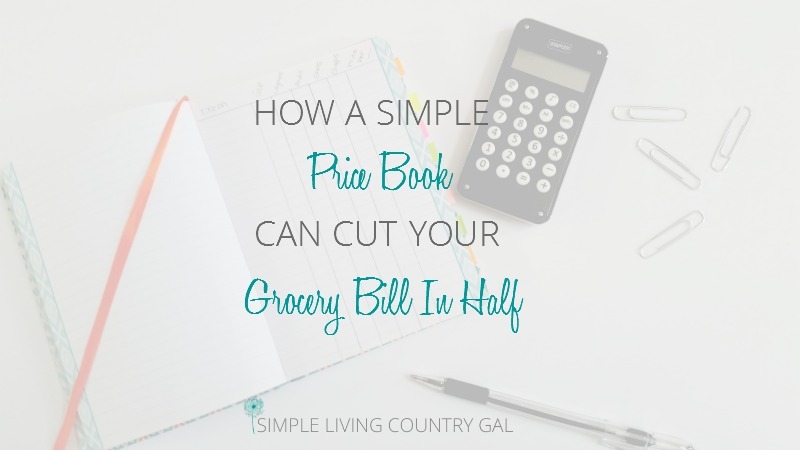 Although time-consuming to set up, a price book can really lower your grocery budget. Educate yourself on the prices of items you use every month and you will never overpay again. This is a game changer friends! Learn to outsmart your grocery store and keep more of your hard-earned money in your pocket. And receive your free price book printable! You are IN! Now check your email to confirm your subscription and get an instant download of pricebook printable! « Organizing Solutions – Finally Remove That Clutter! Love this idea! Thanks for sharing, and making it super simple to incorporate! If you fill out the opt-in form the printable will be sent right to your inbox. Thank you for making this so much easier. Love this idea! I wanted to do something like this, but didn’t know where to start. Thanks for the motivation! I confirmed my subscription but did not get the download? What did i do wrong? It automatically downloads, so it should be in your download file. I sent you a copy just in case you can’t fine it! This didn’t appear to download for me. Did I do womething wrong? I don’t see it in my downloads. Yes, the unit price is how YOU want to list it. So, you can do by the ounce, grams or liters. For me, I always use ounce. Keeping the same measure throughout the book helps to keep things consistent. This way you will know for sure if the deal is a good one. Stores try to trick us by listing different unit prices. Next time you are at the store just look! One item will list the unit price by ounce while an item just a little further down the isle is by item. Also, you may notice products get smaller while prices stay the same. If you know the price per ounce you will know when the manufacturer is trying to pull a fast one on you. This one bothers me the most. So many times people just blindly shop without realizing boxes and bags are smaller. We are in a sense paying more without even realizing it. Having a price book will end all of that! This was am awesome find on Pinterest! Thanks for taking the time to share it. It’s only my boyfriend and I that live together and grocery shopping is our biggest bill! This will be very helpful to help save money! so glad I was able to help! I used to spend so much on groceries, it was crazy. Took a while to get things under control and I wish I had started much earlier. Oh the money I could have saved! This is a great idea! I’m not sure if I’d be able to do this unless I get the chance to go grocery shopping without kids. Fingers crossed! Thanks for the printable! Yes, I totally get it. When my kiddos were younger I would do my shopping at night when Hubs was home to babysit for me. Then a few of the local grocery stores started offering free daycare right in the stores. Total game changer right there! !